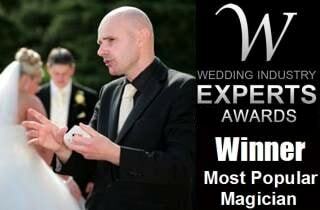 Wedding magician David Fox is an excellent choice of entertainer for your special day in Rugby. A party is a fitting occasion for magic and illusion. David is the first-choice magician for party-planners in the Rugby area. Businesses in Rugby book Magic Circle magician David Fox to greatly enhance their corporate functions and promotions. An award winning magician, entertainer and illusionist for events in Rugby! For magic in Rugby, Magic Circle magician David Fox is the number one choice for companies, party organisers and brides and grooms to be. David's slick magical skills are always certain to stun your guests if you are organising a special event in Rugby and the surrounding area. With over a decade of experience entertaining at many of the most prestigious venues in the world, David Fox will create a unique magical package which will suit your wedding, corporate event or party in Rugby. David is a proud member of the Magic Circle and his magic is suitable for audiences of all age groups and social backgrounds. 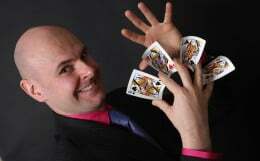 Contact David Fox today for magic at your next important function in Rugby. Indeed, David is proud to have represented an array of companies throughout the Warwickshire area. These include: Hilton Hotels, Marriott Hotels, Vanguard Logistics and Hand Picked Hotels. The conference centre of Benn Hall, the elegant Coombe Abbey and Coton House in Churchover are all excellent locations around Rugby for a man of David Fox's exceptional talents to weave his magical spells!